Is Reylo a thing? How did Leia survive space? So. Many. Questions. Star Wars: The Last Jedi may have been one of the longest movies set in a galaxy far, far away, but it couldn’t fit in everything. That’s where the novelisation comes in. A few lucky people (and a few naughty ones potentially breaching embargos) have managed to get their hands on copies before its release on March 6 and, oh boy, is there a lot to talk about. Reylo, Snoke’s backstory, Luke's final moments, it’s all here – and more. As the book isn’t out yet and we haven’t been able to get out hands on a copy thus far, all the info below is from sources via Reddit, Twitter, and Tumblr, and so, while it’s easy to believe everything you read on the internet, we recommend treading carefully! This is one for shippers and those passionate about OTPs. Judging from the passage below, Rey suddenly realises that Kylo might have the hots for her. How that sets up Star Wars 9 is anyone’s guess, but it certainly paints that shirtless scene in a whole new light. Oh, Snoke. Snoke, Snoke, Snoke. Probably the biggest disappointment for many upon leaving theaters was the lack of a big reveal surrounding the First Order’s head honcho. The novel does give us a few interesting tidbits, however. According to Redditor OmNomAnor, Snoke not only wasn’t expected to be First Order leader, he also learned of hidden Force powers in the Unknown Regions, which is why he is far more powerful than anyone in the movie. In case there was any doubt, he also wanted Rey to become his apprentice, so there’s that. The twin setting suns that signalled Luke’s death was powerful enough, but it could have been even more tear-jerking. He hears a voice – surely master Obi-Wan’s – telling him to let go. That’s then followed up by Leia sharing a moment with Chewie and saying “It’s just us now.” Sad face. Did Luke expect to die? According to the novel: absolutely. In fact, burning down the library was only the first part on his path to self-destruction. The second, obviously, came later as he passes away. It’s good to see that the novelisation actually cleared that up, though – otherwise Luke comes across as a bit more hot-headed than we all thought. How did Leia survive heading into space? Well, she maybe didn’t. 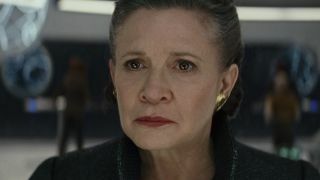 Potential spoilers for Star Wars 9 here (should they take that route), but it’s clear that all is not well with Leia upon her return from the stars. She’s suffering from solar radiation and hypoxia. Even for a force-Wielder, that’s probably a death sentence. Does Luke know about Snoke? The Last Jedi left out a lot of riskier elements. But read why the most daring thing Star Wars: The Last Jedi did was embrace the prequels.